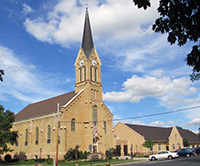 The Catholic community of Belle Plaine has a long standing tradtion of supporting Catholic education. The parish school was founded over 120 years ago by the Benedictine Sisters. They still hold classes in the original building which was built in 1878, and added on to in 1898 and 1903. It is their mission to provide for the "intellectual, spiritual, moral, physical and academic formation of the children from 3K through sixth grade, according to the principles of Catholic Faith and the finest educational standards". For over 100 years the school was staffed by religious orders. The Benedictine Sisters served the school for over sixty years and the Poor Handmaids of Jesus Christ served for forty years. The faculty is currently all certified lay teachers. As a Catholic school, their faculty sees their work as a mission to share the Catholic faith with others. They are a part of the Archidiocese of St. Paul/Minneapolis and accrediated by the Minnesota Non-public School Accrediting Association. OLP Catholic School is fortunate to be able to provide small class sizes for the students. Weekly instruction is also given in specialty areas such as art, music, physical education, library, computers and religious enrichment. Students in grades five and six may participate in band. The curriculum is written by the staff to best meet the needs of their students and set high academic standards. Opportunities are found for all types of learners - hands on activities, group work and individual projects are just a few of the opportunities. As a school community, OLP Catholic School celebrates Mass weekly. Students participate in all parts of the Mass. Opportunities to serve others is an integral part of their curriculum. Religion is not only a subject, but also their faith, and is integrated into all that they do as learners and as a community of faith. The OLP Catholic School has a desire to share their school with others and encourages you to stop by or contact them for more information.